Father James Mallon is a priest of the Archdiocese of Halifax and Pastor of Saint Benedict Parish in Halifax, Nova Scotia. He is an Alpha advisor and conference speaker. 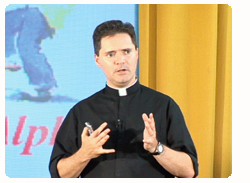 He serves on the board of Alpha Canada, The Global Alpha Catholic Board and is an advisor for Alpha for Catholics U.S.A. Father James is the founder and director of the John Paul II Media Institute. He has been running the Alpha Course in his various parishes since 2001. He developed Catholicism 201 later that year as a follow up to the Alpha Course. He continues to run both courses in his present parish.